The latest collection of GTA and Rockstar-inspired pics and original fandom artwork features some spot-on re-enactments of classic movie scenes and album covers, a pair of epically constructed landscape panoramas, some undeniably cute drawings of GTAV characters including paparazzo Beverly and young Franklin playing with puppy Chop – and lots more. As always, if you’ve got something great you think deserves to be shared here at the Newswire, make sure to send it our way via Mouthoff and follow us at instagram.com/rockstargames for all the latest official pics. 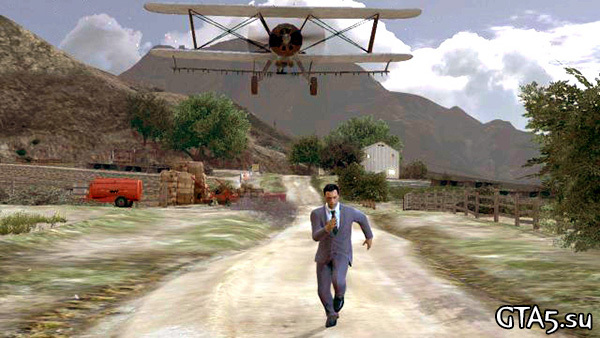 “That plane’s dusting crops where there ain’t no crops.” With buddy merrymint behind the stick of the Duster, _zdah_ awesomely recreated this famous scene from the Hitchcock classic North by Northwest right down to Roger Thornhill’s signature grey suit and shared it on Reddit. 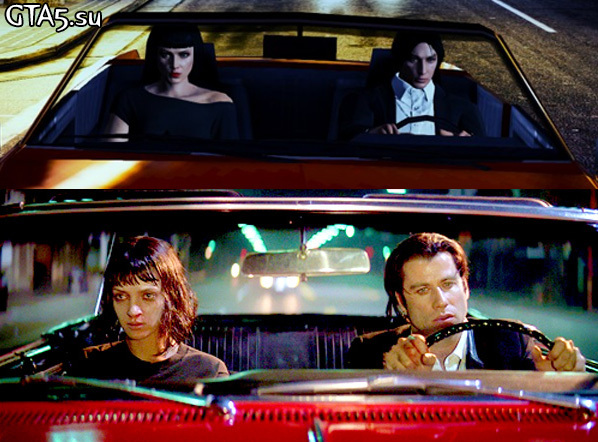 Also seen on Reddit, wheresmycokehoney answered the challenge to recreate a movie scene in GTA Online with this shot of Vincent and Mrs. Wallace from Pulp Fiction. M8_NUMERO_UNO and friend qel_droma_blood sent us their remake of Pink Floyd’s album cover for the classic Wish You Were Here LP, using Snapmatic and a little post-production photo editing to stage the iconic shot. Shine on, you crazy diamonds! Snapmatic ace FunDwayno took these absolutely gorgeous panoramas capturing the lights of Los Santos and the calm of Blaine County. You’ll definitely want to click the images above to see them in full resolution. Smokin’ and ridin’, smokin’ and ridin’… We can’t tell whether jBhIpS (aka ILYA aka the prolific and creative Ferino Design) and his buddy are speeding away from trouble or towards it in this one, but judging from the bloodstained Business attire of the fella riding shotgun, they’re not out for a Sunday drive. Inspired by the Humans of New York photography project, Redditor fratuzzi created this excellent Humans of Los Santos Snapmatic series, adding touching quotes to tell often bizarre and tragic imagined stories of various Los Santos pedestrians. Check out parts 1, 2 and 3. Person of the Year? Only an outlet like ‘CRIME’ magazine would choose Trevor Philips for such an accolade. This spoof magazine cover by Japanese deviantARTist newjackal7 shows the man of the hour looking characteristically pleased as punch about it. Another gem from artist Misia, recently featured for her vintage comic strip of GTAV characters, here showing off adorable caricatures of Trevor, Michael and Franklin’s original and extra-crispy custom looks. Buns aka Fetus on Tumblr references a popular puppy pic and rewinds the clock for this sweet imagining of a young Franklin and his puppy Chop in simpler times. Talented artist and big time GTAV fan Sarah Ann Kirby sketches out one of the rarer characters in the fandom artwork world, Los Santos paparazzo Beverly – saying “Beverly is a slimy little a*****e but he’s so likeable; in a cute, annoying way <3”. 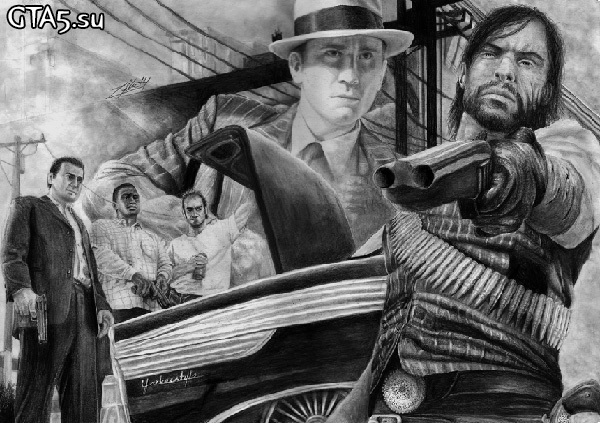 Swedish artist Jennifer Carlsson, AKA Yankeestyle94 on deviantART, specializes in pencil portraiture (check out her jaw-dropping photo-realistic sketch of a 1980s Madonna) – and here she pays tribute to Rockstar with this graphite montage of GTAV, Red Dead Redemption and L.A. Noire. It took her 21 hours in total to create the detailed piece – check out a sped up YouTube Video of it all coming together.